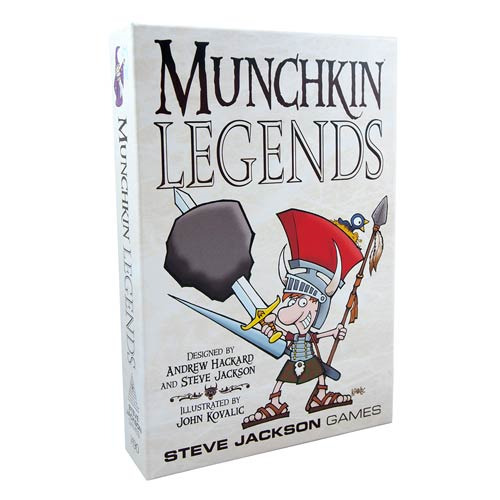 Raid the world of myth and legend with the Munchkin Legends Game! Crush every foe you meet. Backstab your friends and steal their stuff. Grab the treasure and run. Munchkin Legends is the Munchkin card game about legendary adventure... with none of that stupid roleplaying stuff. You'll defeat mythic monsters and grab fabled magic items! Don the Death Mask and Achilles' Heels. Wield Thor's Hammer... or maybe the Magic Bassoon. Start by slaughtering the Heebie-Jeebies and Johnny Zucchiniseed, and work your way up to the Kraken! Fast-playing and silly, Munchkin Legends can reduce any group to hysteria. And, while they're laughing, you can sneak past them for the win. Ages 10 and up.